It's time for another wedding blog post! 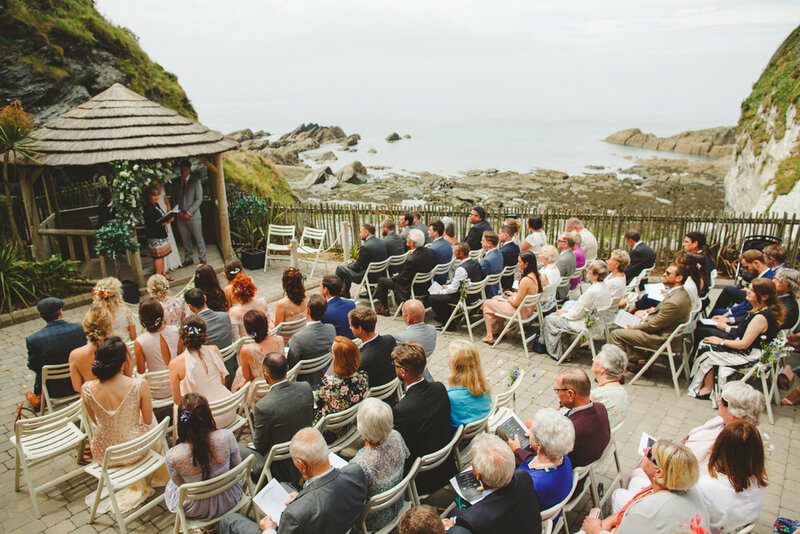 Soleil and Dave got hitched in Ilfracombe, in Devon at Tunnels Beaches. Tunnels Beaches is essentially what would happen if a wedding photographer could design a wedding venue. The location is stunning, the food is great, the management are wonderful, the light is gorgeous, the space is versatile and there's a cracking, uninterrupted horizon for the sun to set on if the weather is kind. Add in a relaxed and open hearted couple with creative flair and that's a recipe for a dream job right there. Time to hand over to them to fill you in on their wedding planning journey... just as soon as you've watched their wedding film that is! We started planning our wedding just over a year before the big day. We went to visit Tunnels Beaches in Ilfracombe after seeing it on the internet and knew it was the place we wanted to get married right away! 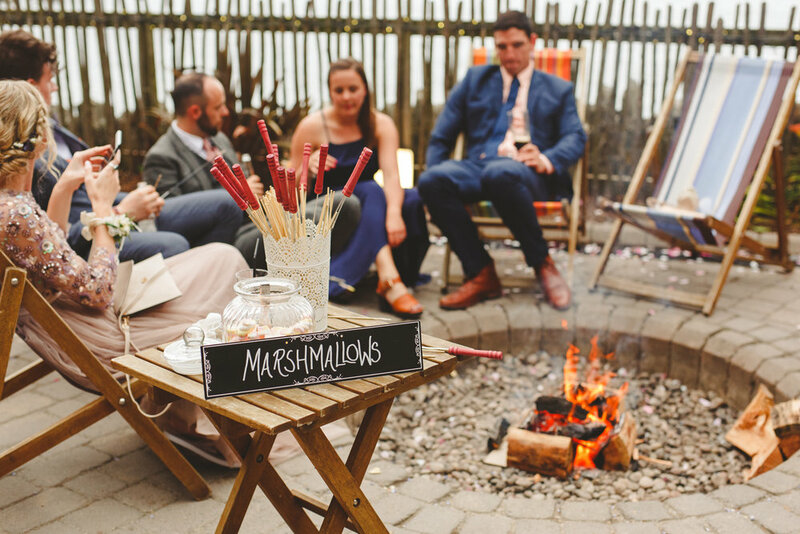 The relaxed feel and the beautiful set up was exactly what we had in mind for a bohemian beach festival wedding. We enjoyed every part of planning, especially putting together all the bits that made it unique to us. From day one we knew we wanted a certain element of DIY without doing all of it ourselves to avoid too much stress! I loved the idea of doing our own aisle flowers and button holes to give it a personal touch. However doing all of the flowers would have been too much. 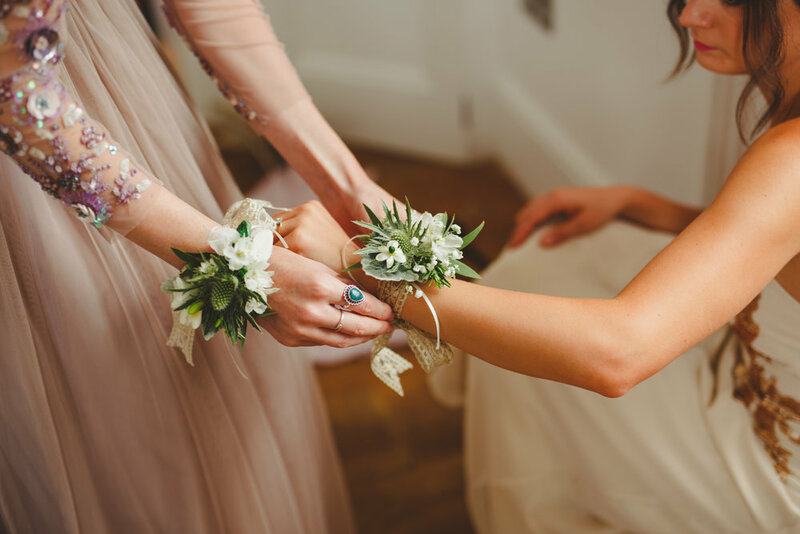 We used Sweet Williams flowers who are based in Ilfracombe to do the bridal bouquet, the marriage structure and the bridesmaids wrist corsages. All of the table flowers, button holes etc came from Wight Flower Farm in the isle of Wight (They traveled with my mum and Nan in the car!) As the farm grow the flowers themselves you get beautiful home grown seasonal cottage flowers at a great price! It meant we could put them together ourselves. Pintrest was amazing to help put together ideas visually and to explain to others the feel/look we were going for. Along the way it was clear that our bohemian ideas had given us a strong pretty garden feel with elements of copper, succulents and glam rusticness, So we went with that to bring it all together! We knew straight away that tradition was out of the window when it came to our best men and bridesmaids. Dave having three best men and me with a bride tribe of 10! A mix match colour palette for the bridal party meant a variety of shades and textures which went beautifully together! It also meant we had plenty of help with fun 'making days' to put together our own table decorations, place settings, bridal favours and even a secret flashmob for the guests! Doing all these extras bits and planning yourself is very rewarding but I would say the most challenging bit is handing this all over on the day! Anyone wanting to do their wedding without a wedding planner I would advise to be sure you have a strong team around you who are all on board with what has been inside your head for the last year! Thankfully we did! Because of this the day went exactly to plan and everything looked and felt beautiful! The day started with a good breakfast for all! 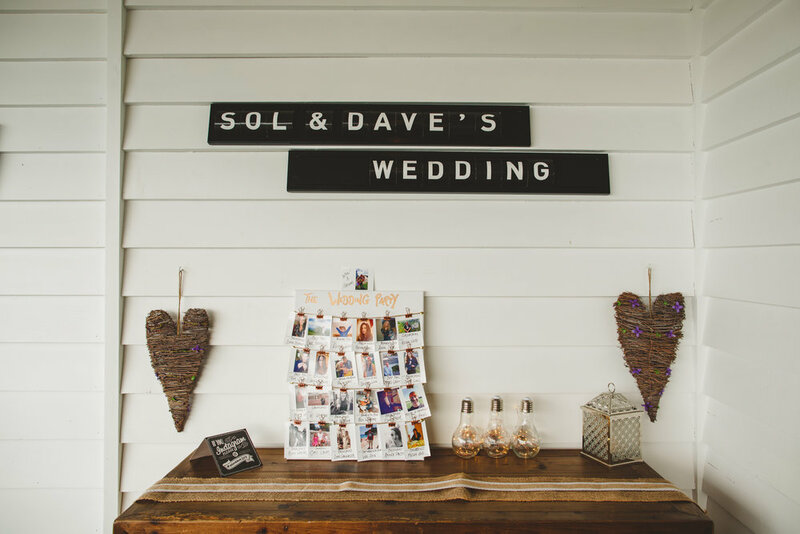 Me and Dave are both a big fan of brunch and not ones to want to get hungry just before saying 'I do'. We had hired two houses to accommodate the majority of the wedding party, Bath house (part of Tunnels Beaches) was where the girls got ready and The Elmfield up the road from Tunnels Beaches (fantastic party house with a bar and pool!) was where Dave stayed the night before with his groomsmen. We knew we wanted to spend as much time as possible with everyone and for that reason choose accommodation where we could all get together and socialise over the few days spent in Devon. After breakfast the bride tribe were all hands on deck to get the last bits ready down at the venue - Flowers to put together and in place. We ordered a 'Naked Wedding Cake' From Waitrose, so a few of the bridesmaids worked on putting that together. It looked beautiful with flowers and berries on top! Once everything was in place and I had had a chat with the manager on for that day about music etc we headed back to finish getting ready. 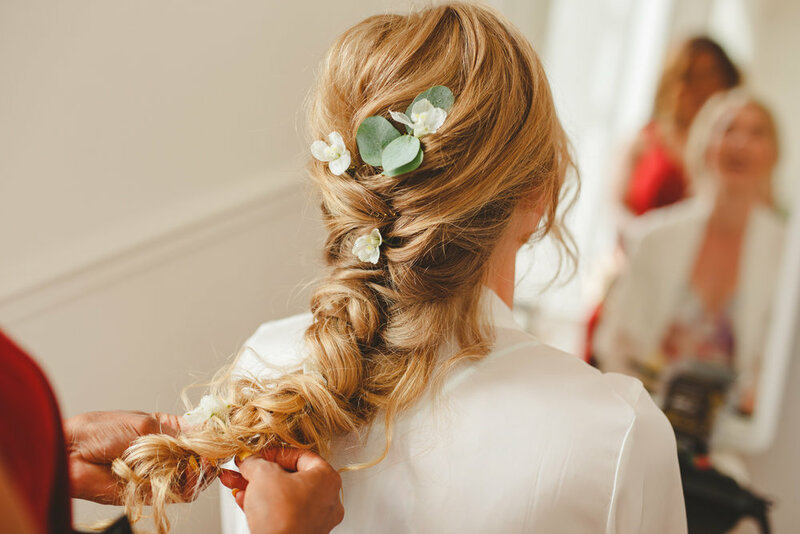 Kyrelle specializes in bohemian wedding and festival hair (Devon Wedding hair) she did 10 Bridesmaid and a Brides hair in four and a half hours!! Everybody looked fabulous and it was time to walk down the aisle and get in place. This bit was especially fun and nerve racking! 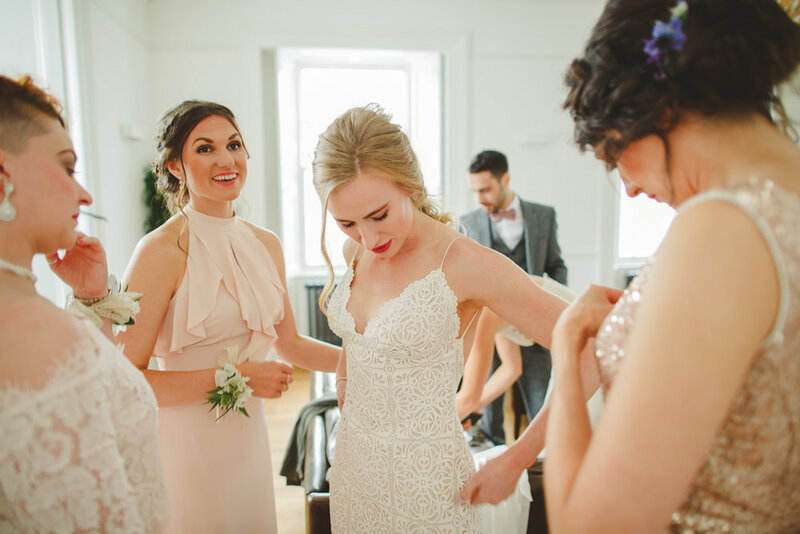 Tunnels has got a small bridal room where you can touch up and get ready whilst everyone is taking their seats, this was a perfect opportunity to take some fun pictures and boomerangs! The Groom and groomsmen walked down to the venue together and were the ushers handing out programmes and helping people find their seats. Tunnels staff were fantastic from start to finish, they even helped all the groomsmen with their buttonholes at the beginning of the day! We hired Will Herring to play as guests were arriving - he was perfect for the day and very talented! He did a set on piano and an acoustic guitar set. It gave it such a lovely relaxed feel and he even stepped in to do a song for us during the ceremony! For the ceremony we had two readings - 'The first day of my life' song lyrics by bright eyes and 'The lovely love story' By Edward Monkton. 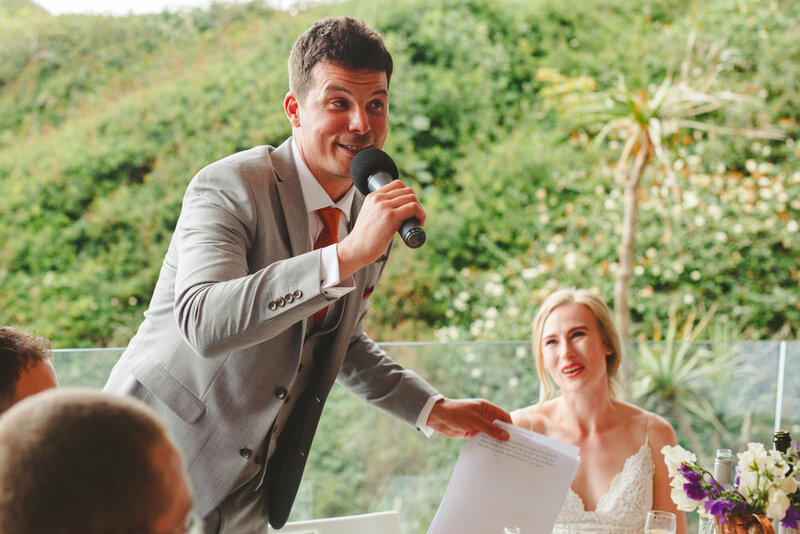 We had a surprise song in an envelope - 'Lean on me' by Bill Withers, that we asked everyone to open - Will played this on the piano and sang along, it was a great moment! We walked out to 'You Never Can Tell' by Chuck Berry, it was so fun dancing down the aisle pulp fiction style! Canapes and pimms were served whilst we had photos on the beach - we really had fun with these! After a wonderful gourmet BBQ, which everyone commented on saying it was the best wedding food they had ever had! And the speeches from which our faces hurt from laughing, it was downstairs to cut the cake and take part in a few casual beach games on the patio. 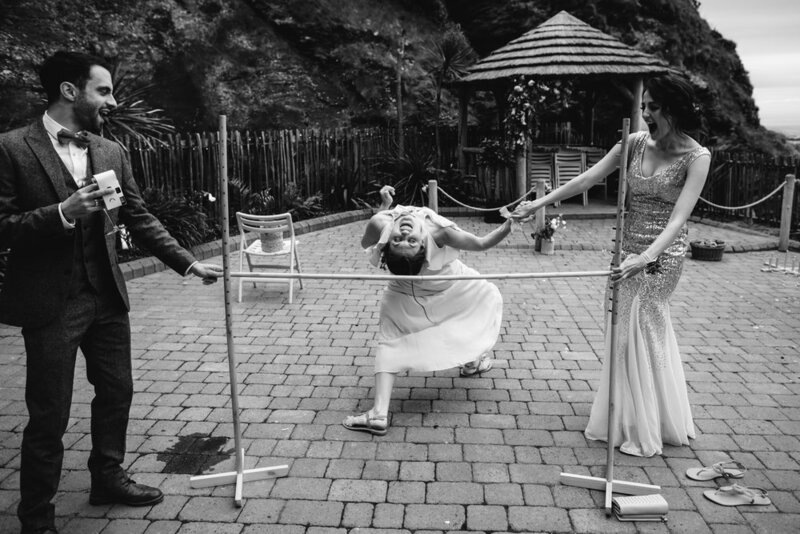 Limbo turned out to be a big hit and we got some hilarious pictures from this too! For the first dance we used 'Colorblind' by Counting Crows, Dave had learnt how to lead me on the dance floor from a friend who is trained in dance, we kept this as improvisation as we had prepared a surprise choreographed flashmob with our friends also! I'm lucky enough to have friends who are dancers, I'm a dancer myself and a few men who are good sports so this entertainment went down very well after only one rehearsal! However if anyone is planning on doing this make sure you leave plenty of time to practice! The whole thing got everyone up dancing at the night to Saturday night Fever and the video has been a great hit ever since!! The band kicked in right after this - We used 'Session One' who play old, new and soul music, Charlotte the singer and the rest of the band are fantastic and a great party band to get everyone up dancing/singing along! To finish we wanted to include an element of how we originally got together and when we first decided to get married. At Glastonbury 2009 we had a 'on mass' pagan ceremony which meant we and a field of about 200 people got married together at a pagan ceremony. We vowed to be committed to each other for a year and a day and it acted as a sort of trail marriage and commitment of friendship/unity. We wanted to recreate this at Sunset at Tunnels Beaches. Outside, the Bridesmaids gave out friendship bracelets and Haribo rings. Dave's brother and a friend read out the funny story of us getting married all those years ago and then we said vows all together and jumped the broom to tie the knot for a year and a day! This was great fun and so special to do at sunset on the beach with that spectacular view. Old couples renewed their vows for one another, new friendships and bonds were formed and we got some epic jumping pictures!!!! All of them! !We particularly like the natural photos and the one of everyone taken from the roof top with our little niece (Elodie) asleep in the background on the big deck chair! Also the 'us' photos on the beach - so special to have. The silly snap shot ones with all the bridesmaids and groomsmen are great too! 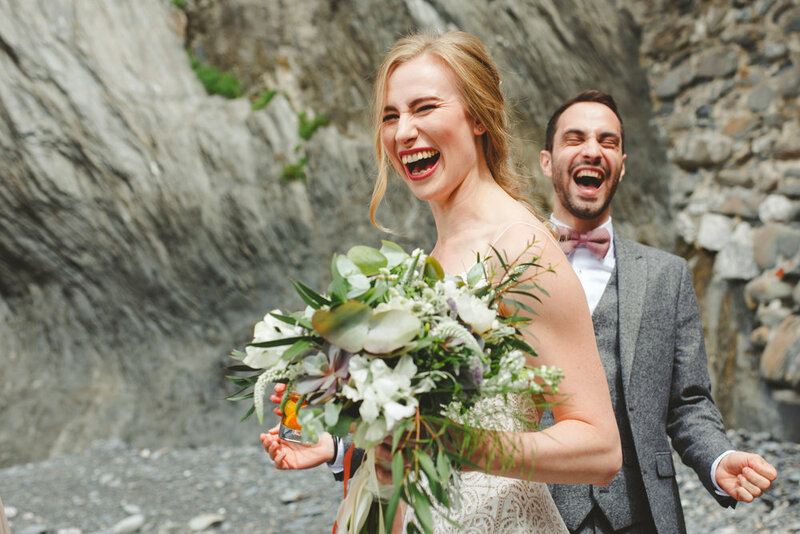 The best advice we got given was to make sure to take moment for yourselves - take 5 minutes every hour to be by yourselves somewhere, take it in, squeal 'we are married' and enjoy it! Try not to get too hung up on 'things' or how it should be - remember why you are getting married in the first place and roll with it! A night before supper for all the guests means a lot of pleasantries with various family members that you may not have seen for ten years are out of the way by the big day! This means more time for celebrating and having fun on the actual day - after all everyone is there to celebrate with you both and not to talk about what you have been doing at work for the past 5 years! Camera Hannah is fantastic at capturing the mood and the moment. If someone cracks a real smile - she is there, if someone does a fabulous lunge on the dance floor - she is there - without even knowing she took the photograph! Her photos reflect humans at their best with all emotions involved. She has a unique gift for sensing when a moment is about to happen and captures it beautifully. A very warm and down to earth character. She was very easy to work with on the day, always happy to get some impromptu shots when we thought a moment needed capturing, even during the official group shots. We were very at ease with the photography in general it was not in the slightest bit intrusive. The short film captured the day so perfectly, we are really happy we chose to include this - such a magical thing to look back on! Everyone has commented on how wonderful it is!